This is one of my favorite recipes ever! 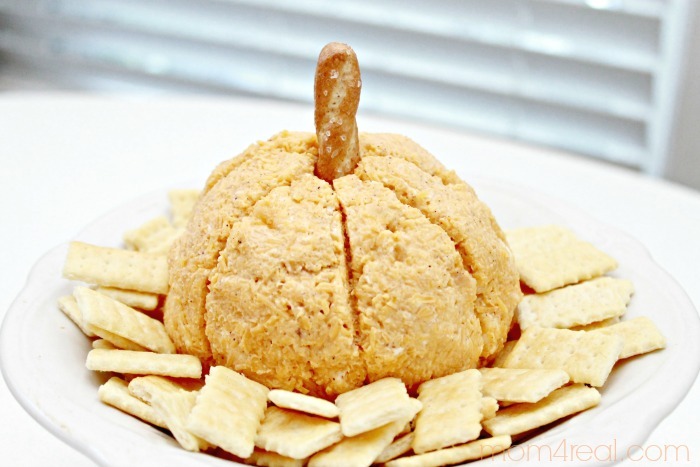 It marries two things that I love…pumpkin and cheese! It was passed down to me by my mother-in-law years ago, and remains one of my favorite fall treats! 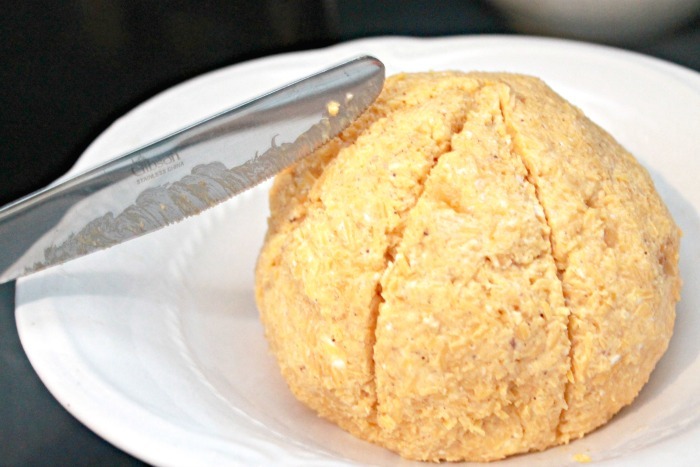 I’m so excited to share this fabulous Pumpkin Cheese Ball Recipe with you today! 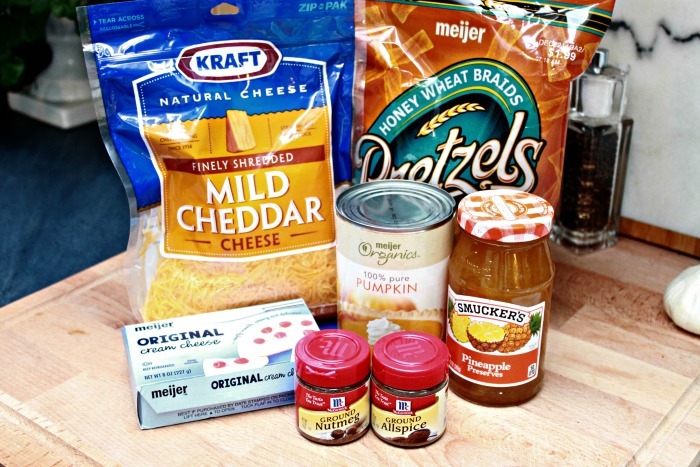 Above are the things you will need to make your pumpkin cheese ball! 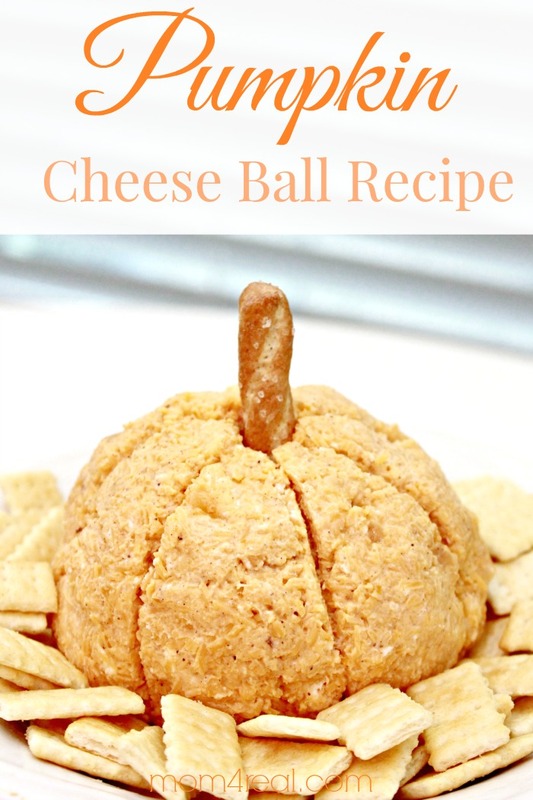 Mix the cheeses, pumpkin, and spices thoroughly in a bowl. Cover and let chill in refrigerator for 2-3 hours. 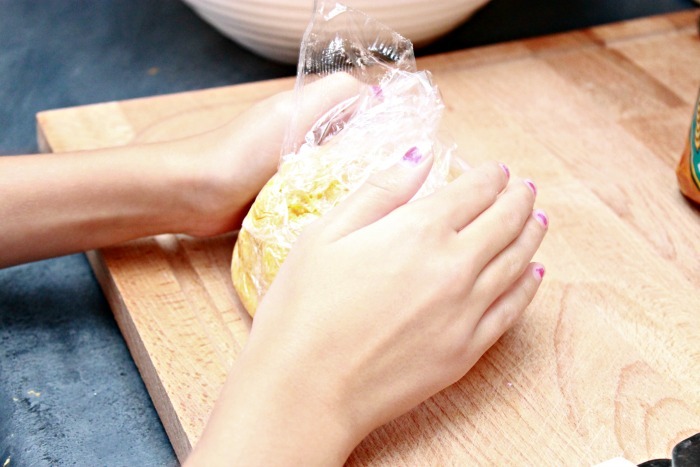 Lay cheese mixture in the middle of a large piece of plastic wrap and shape into a circle or pumpkin shape. Use a knife to score lines all around the “pumpkin”. Poke a pretzel rod into the middle, and serve with the cracker of your choice! 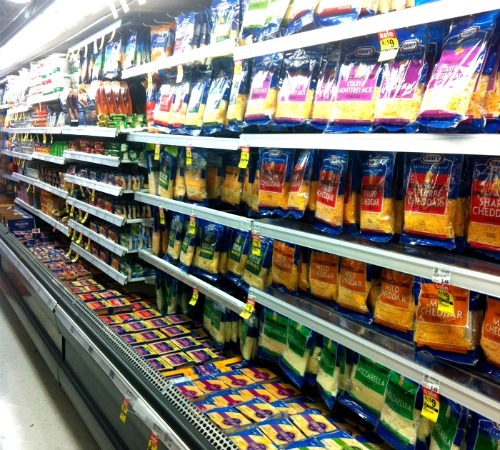 I hit Meijer and snagged my KRAFT shredded cheddar for less than $2 thanks to a sale they had going on and a coupon that I clipped using my Meijer mperks app! Whoop! Can I just tell you how much I love this mperks? 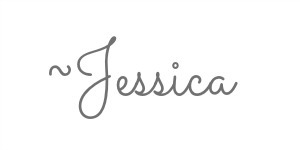 I can plan my entire shopping trip using it, and clip coupons without actually clipping them! I simply pick which coupons I want to use on the app, and it saves them for me…at checkout I simply enter my mperks i.d. and it takes them off for me…score! 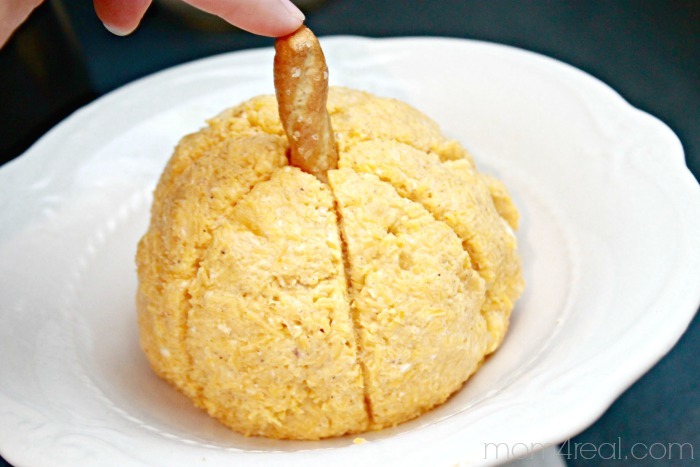 Back to the yummiest cheese ball ever! It’s so simple to make that Kate took a turn at it this time. 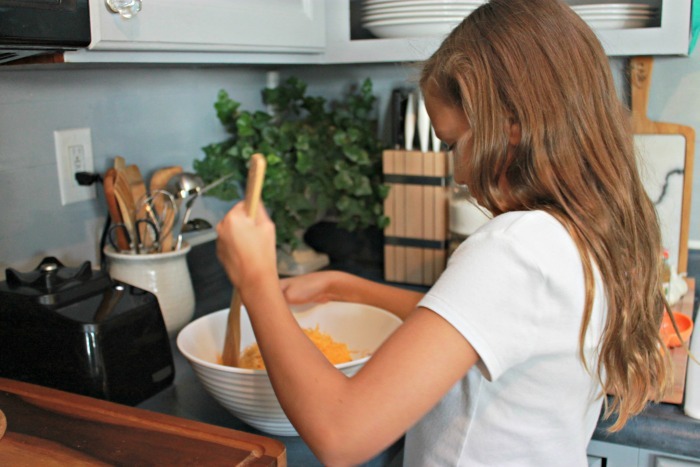 She measured out and added all of the cheese, pumpkin, preserves and spices and mixed them well. Then we covered it and let it sit in the fridge for 2 hours. Once it had time to set, she took it out and placed it on the plastic wrap that was covering it in the fridge and used the plastic wrap to shape the mixture into a ball…or pumpkin. Once it was shaped like a pumpkin, I took a knife and scored the sides to make it look more pumpkin like! Every pumpkin needs a stem, so we simply poked a preztel rod into the middle and tada…it looks like a pumpkin! Place it on a plate or in a dish, surround it with crackers, and it’s ready to serve! Cute, right? Delicious too…pinky promise! Want to give it as a gift? We did! We created this fun gift to send to Kate’s favorite teacher! While I was at Meijer, I spotted this cute little mason jar caddy and had to get it…it was on clearance for less than $6! We filled one mason jar with pumpkin cheeseball mixture and wrote the instructions for turning it into a cheese ball on the top, then filled another mason jar with crackers. 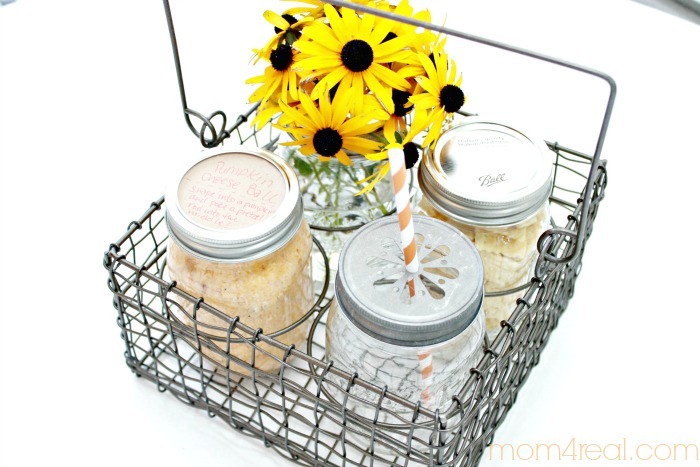 To finish the basket off, we cut some flowers from our garden and added them to a mason jar, then took a cute daisy cut mason jar lid and paper straw and added them to make a cute mason jar cup! Super fun, right? Kate’s teacher absolutely loved it, and said it made her day! « How to Prepare for an Amusement Park Trip ~ Six Flags Tickets Givewaway! 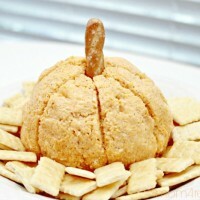 How perfect for a fall or Halloween party! Thanks for the recipe and have a great week!